Life, and Unleash Your Magnificence! 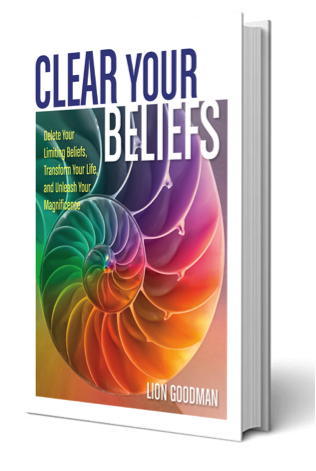 We’d be delighted to send you a free copy of Lion’s multimedia eBook, Clear Your Beliefs: Delete Your Limiting Beliefs and Transform Your Life. It’s been downloaded by more than 10,000 people since its publication. This 40-page multimedia book describes the art and science of the Clear Beliefs Process. It offers an explanation for why you do what you do, and why it’s so difficult to change your habitual patterns of thought and behavior. It’s a beautifully produced primer on beliefs. Included is an exercise to begin your exploration: Belief Self-Diagnosis. You will also receive Lion’s periodic newsletter about beliefs, belief-change, and transformation. If we can ever provide you with answers to your questions, guidance on your path, or good, deep conversation about these topics, please contact us through clearyourbeliefs.com/contact/ We look forward to staying connected.